This is the third in a series of tips for more effective communication. Focus on the goal of being authentic and true to yourself in your interactions while looking for win-win solutions. Years ago, I worried about spelling out these details of how to communicate because I thought some people might use them to manipulate others, but I don’t worry anymore. When you are not interested in another person’s needs and just your own, people seem to sense this pretty quickly. If people think you are using techniques to pull something over on them, or gain an advantage, they generally won’t be supportive in return. Although using the process to create a situation where you win and the other person loses may work a few times, in long-term relationships, it won’t. So explore your motives; make it your intention to be authentic. 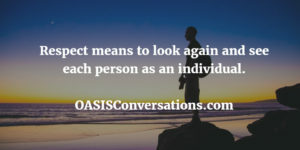 Reveal some of yourself, showing you are human, and have the goal of understanding others and coming to an agreement that will benefit those involved. Tell the truth—as much of it as you know or can. Otherwise, you will lose credibility with people and they may not believe you next time. I remember a colleague who often exaggerated or simply said things that were not accurate. As people became aware of this pattern, they did not want to work with her, which caused a lot of problems for her and her coworkers. Actually, if you have good intentions and state what is accurate, most people will be willing to work with you and grow to trust you. When you do make mistakes, acknowledge them, make amends, and move on. After a CEO apologized to staff for a difficult reorganization, staff members were able to stop fighting him and resume work. Most of the time, people will forgive you, recognizing that everyone does make mistakes occasionally. After all, we are all human. When we are authentic and have integrity, congruence occurs with what we say (words), our posture or how we hold ourselves (body language), and our emotions or mood (tone). Seminal research by Albert Mehrabian based on experiments dealing with communicating feelings and attitudes shows that when there is incongruity, people tend to believe body language or nonverbal behavior over spoken words. In fact, his research suggests that 7 percent of a message pertaining to feelings and attitudes is in the words spoken, while 38 percent of the same message is conveyed by the tone or emotion used in speaking those words. Finally, 55 percent of the message is conveyed by facial or body expression. The more you become aware of the connection between your emotions, your body language, and your words and thoughts, the better able you will be to check in with yourself and ensure more congruity. In addition, you will be able to understand others by paying attention to their words, emotions, and body language. This entry was posted in Authenticity, Communication, Main by Ann Van Eron. Bookmark the permalink.